Price has moved slightly lower, remaining above the invalidation point which is very close by. 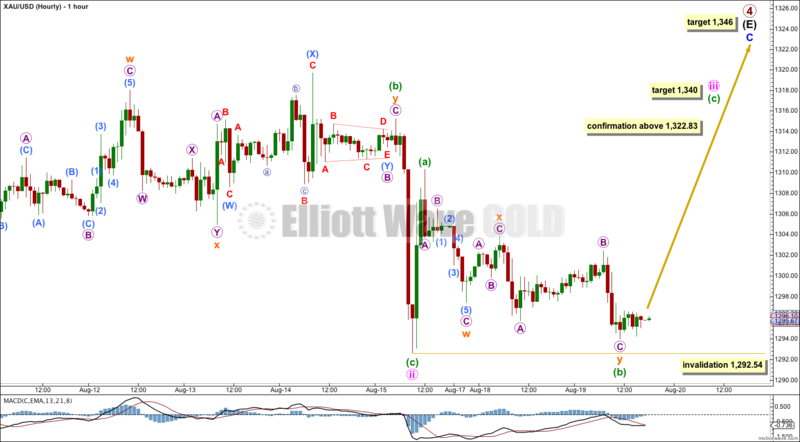 I have just the one hourly Elliott wave count for you today. The alternate Elliott wave counts still have a lower probability. Summary: The short/mid term target for upwards movement is 1,340. The target for upwards movement to end is still 1,346 and this may be about eight days away. On the way up movement will be very choppy and overlapping. Primary wave 4 is an incomplete regular contracting triangle. Primary wave 2 was a deep 68% running flat correction. Primary wave 4 is showing alternation in depth and some alternation in structure. Within the triangle of primary wave 4 intermediate wave (E) is unfolding as a zigzag: minor wave A is a five wave impulse and minor wave B downwards is a zigzag. Minor wave C must subdivide as a five wave structure. At 1,346 minor wave C would move slightly above the end of minor wave A at 1,345.22 and avoid a truncation, and intermediate wave (E) would fall short of the (A)-(C) trend line. There are three nice examples of triangles on this daily chart: within intermediate wave (D), within minor wave A of intermediate wave (E), and within minor wave B of intermediate wave (E). In all three examples the final subwave of the triangle ends comfortably short of the A-C trend line. This is the most common place for the final wave of a triangle to end and so that is what I will expect is most likely to happen for this primary degree triangle of primary wave 4. Within minor wave C no second wave correction may move beyond its start below 1,280.35. 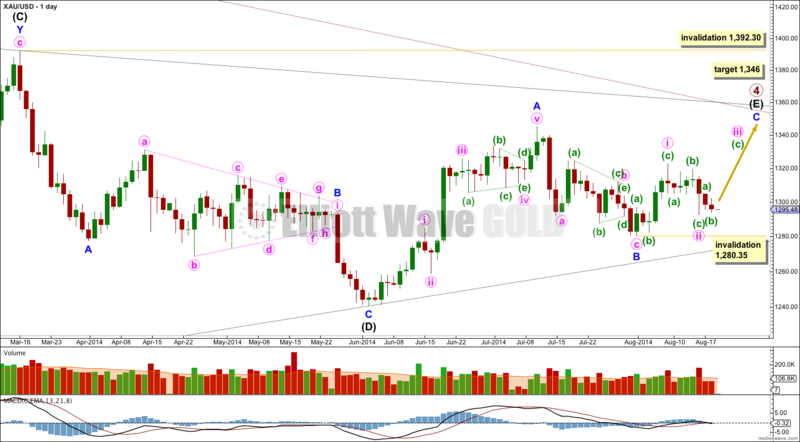 Intermediate wave (E) may not move beyond the end of intermediate wave (C) above 1,392.30. 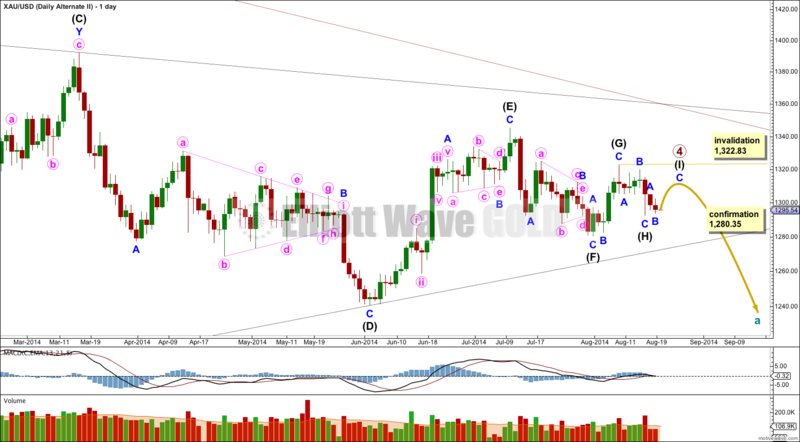 Within minute wave iii the size of the current correction indicates this is not subminuette wave ii, but most likely to be minuette wave (b) mostly because it is showing up clearly on the daily chart. Subminuette wave (b) has continued further sideways and lower as a double zigzag, with the second zigzag in the double deepening the correction. 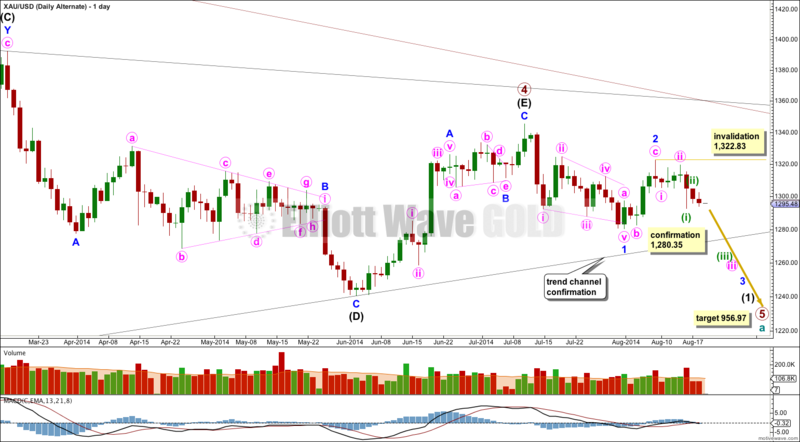 If subminuette wave (b) continues any further it may not move beyond the start of subminuette wave (a) below 1,292.54. At 1,340 minuette wave (c) would reach 2.618 the length of minuette wave (a). This is the Fibonacci ratio I am using because were it to reach only 1.618 the length of minuette wave (a) minute wave iii would not move beyond the end of minute wave i, and it must do to adhere to a core Elliott wave rule. If minute wave iii ends about 1,340 then the ending diagonal would most likely be expanding. Minute wave iii must subdivide as a zigzag because this is a third wave within an ending diagonal. Within an ending diagonal all the subwaves must subdivide only as single zigzag structures. First Alternate Daily Wave Count. This is a new alternate idea which has some validity, and importantly could see the end of primary wave 4 within one to two days. If this is correct then when the final subwave is over the next movement could be a very violent swift downwards movement. It is possible that primary wave 4 is an almost complete nine wave triangle. Triangles may be either five waves (most common) or nine waves (fairly uncommon). Because nine wave triangles are reasonably rare this idea is reduced in probability to an alternate. I would judge this alternate idea to have a better probability than the second alternate below, possibly about a 15% probability. The only other nine wave triangle I have seen of which I am confident is shown on this daily chart. Within intermediate wave (D) minor wave B is a clear nine wave triangle. Within that triangle one of the subwaves can only be seen as a double zigzag, so within a nine wave triangle one of the subwaves may take a more complicated W-X-Y form. This may be what we are seeing here at a larger degree. This alternate idea resolves the problem of proportion within intermediate wave (E): now the triangle is minor wave B and minor wave A is a five wave impulse. Minor waves A and B are nicely in proportion. This triangle does look slightly odd though in that intermediate waves (F), (G) and (H) all fall comfortably short of the triangle trend lines. This is quite different to analogous waves within the nine wave triangle of minor wave B of intermediate wave (D) where minute waves f, g and h were much closer to the triangle trend lines. I would expect intermediate wave (I) to end above 1,310.27 but below 1,322.83. Minor wave C within the final zigzag of intermediate wave (I) should move beyond the end of minor wave A at 1,310.27 to avoid a truncation, but it may not move beyond the end of intermediate wave (G) at 1,322.83. At 1,311.37 minor wave C would reach equality in length with minor wave A. If this idea is correct then when the final ninth wave is complete then the next movement would be the first movement out of a huge triangle. This movement should be expected to be surprisingly swift and violent. Once the triangle could be considered complete then subsequent movement below 1,280.35 would provide confirmation of this alternate. At that stage the main wave count would be invalidated. If this price point is passed with swift downwards movement this would be my preferred wave count. If this wave count is confirmed then I would expect primary wave 5 to be relatively short and brief. When triangles are excessively time consuming then the movement following the triangle is reduced in length. It is possible (but unlikely) that primary wave 4 is over at the high of 1,345.22. If primary wave 4 is over then primary wave 5 downwards would reach equality in length with primary wave 1 at 956.97. Primary wave 1 was a remarkably brief 3 weeks duration. I would expect primary wave 5 to last some months, and is already longer than one month. The only structure which fits for minor wave 1 is a leading contracting diagonal. While leading diagonals are not rare, they are not very common either. This slightly reduces the probability of this wave count. Within diagonals the second and fourth waves are commonly between 0.66 to 0.81 the prior wave. Here minute wave ii is 0.61 the length of minute wave i, just a little shorter than the common length, slightly reducing the probability of this wave count. 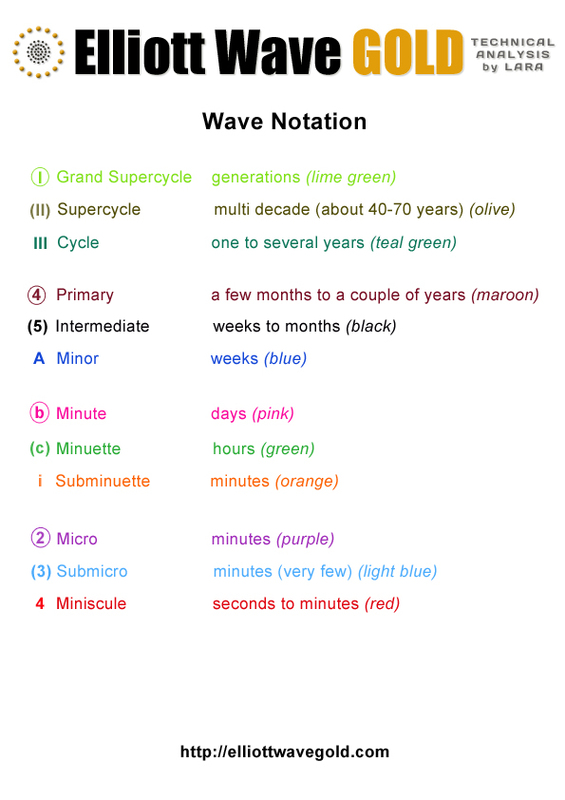 Minute wave iv is 0.66 the length of minute wave iii, just within the common length. Leading diagonals in first wave positions are normally followed by very deep second wave corrections. Minor wave 2 is deep at 65% the length of minor wave 1, but this is not “very” deep. This again very slightly reduces the probability of this wave count. The biggest problem I have with this wave count and the reason for it being an alternate is the leading diagonal following the end of the triangle for primary wave 4. When triangles end the first piece of movement out of the triangle is almost always very strong and swift. 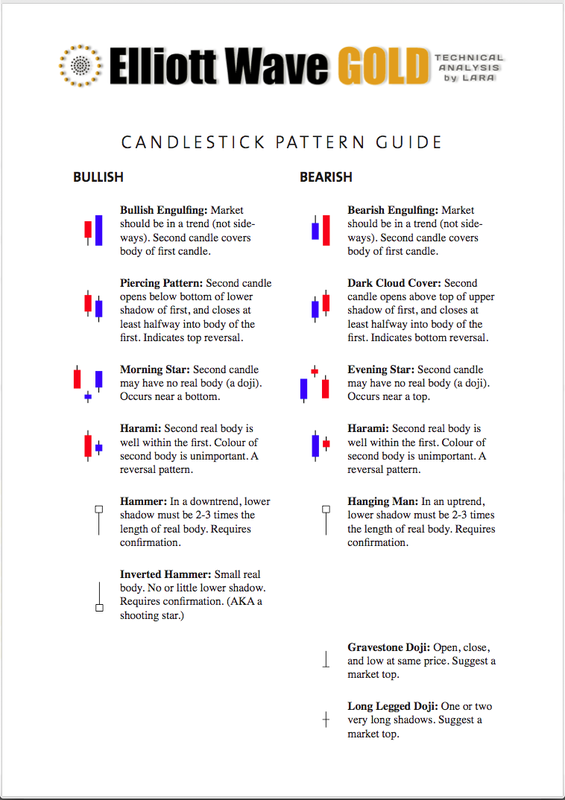 Diagonals are not strong and swift movements. To see a first wave out of a triangle subdividing as a diagonal is highly unusual and does not at all fit with typical behaviour. This substantially reduces the probability of this alternate wave count. I would judge it to have less than a 10% probability. If this wave count is correct then current movement for the last 24 hours should be the start of a third wave, within a third wave, within a third wave. Current movement should be increasing substantially in downwards momentum for this wave count. The fact that it is not further reduces the probability of this alternate today. Within minor wave 3 no second wave correction may move beyond the start of its first wave above 1,322.83. Only if this wave count is confirmed with a new low below 1,280.35 next week would I take it seriously. After that a clear breach of the lower (B)-(D) trend line of the primary wave 4 triangle would provide full and final confirmation of this alternate. A full daily candlestick below that trend line would provide me with 100% confidence in this wave count. This analysis is published about 08:15 p.m. EST. Its still possible, but ATM the second alternate which sees primary 5 underway looks possible. Only a breach of the B-D trend line would finally confirm either way. and as it turns out, you were absolutely spot on. is target 1346 still likely on this new view? A process of elimination sees the most likely scenario as minor wave B within intermediate wave (E) continuing, and it can only be a triangle at this stage as one member Alessandro pointed out yesterday. Why did I not consider that? I did not see the possibility. Thank you for pointing it out. The waves for the triangle would be pretty big…. I’ll chart it in the morning (if its still valid!) and see how it looks on the daily chart. Why you do not consider the possibility that in this moment we are still in a minor wave B, which is developing a triangle ?